Rosie the Camper is almost done! Click here to see all posts from this remodel. As part of our partnership with eBay for this renovation, we'll be showing you how you can use the site for your own renovation projects! I am 100% not the kind of person who dives into tasks and activities I'm not familiar with. Literally I've read the full instructions to UNO before letting everyone start playing. I'm very meticulous and I'm not necessarily proud of it, but like, I'm just saying you'll never see me inadvertently breaking any rules because I'm fully aware of all of the rules/methods/proper steps/etc. all of the time. Usually. We hired someone to come do our tile backsplash for us because 1. we didn't own a tile cutter 2. we've never tiled anything 3. it was for a small space and so we figured an install would be cheap 4. there were just a lot of good reasons to hire someone else to do it. But you know what? The guy didn't show. So. Well. Great. Neither of us had literally any idea what the hell tile installation involved. And of course being the major procrastinators that we are (and yes I get that my aforementioned tendency to read all the guidelines is in complete opposition to my tendency to procrastinate what can I say I'm a 5-star Capricorn leave me alone) we were on a tight deadline to get this tile backsplash done, so it was looking like we had to handle this one all on our own! And wouldn't you know, Beau, the one who's good at improvising on the spot, wasn't free to help me figure out how the to make this happen. So I read a quick article that didn't exactly apply to our situation, drew from some techniques we learned from our concrete overlay countertops adventure, paced down the grout aisle for about an hour, took a risk on a $20 tile cutter, and... I honestly could not be happier with how his thing turned out. I'd very much love to give a thorough how-to for this process, but we're gonna call this more of a "before and after plus tips." Because while I love the result, I can't in good faith sit here and pretend I knew what I was doing while I was doing it. Jump to the bottom for a list of some more in-depth tiling resources! And don't forget you can use eBay to shop for any light industrial tools you might need for projects like this one! We knew we had a lot of geometry going on elsewhere in the camper (triangle floors, mostly) and we wanted those themes to carry on into the kitchenette. We toyed around with the idea of bringing some multicolored bluish green patterns into our design here, but with the overall palette of the camper skewing yellow/pink, we felt like that blue direction would take us into a primary color scenario we were *not* going for. 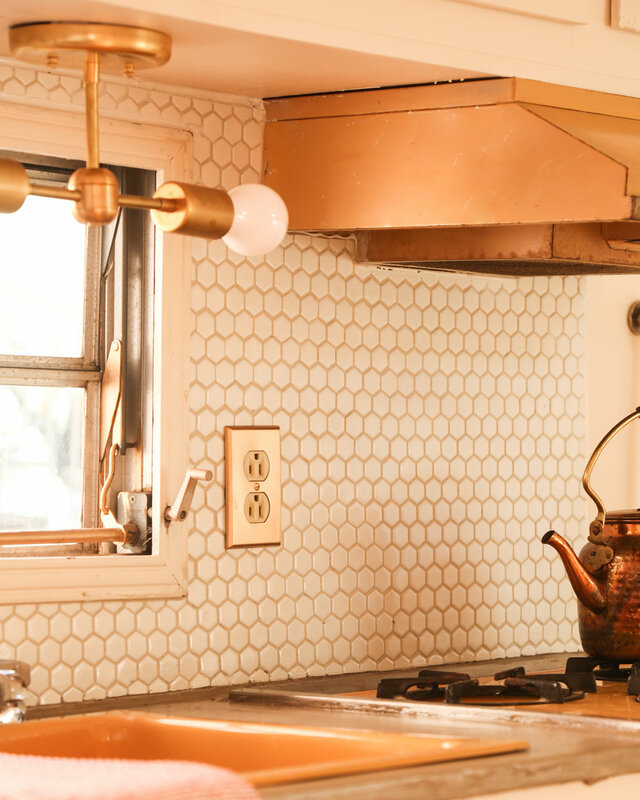 We ultimately decided to stick with a bright white hexagon and let the shapes, rather than the colors, be the bold aspect of this backsplash. Our tile came in sheets that were properly spaced out with netting, but we also made use of 1/8" tile spacers for when we had single pieces we'd cut from the netting. I was really confused about how the spacers would work at first, but once I started using them I felt like an idiot because there's no like actual trick to it. You just put it there so the tiles are the right distance from each other, it sticks to the mastic just like the tile, and then you take it out when the tiles are in place. Simple. If you don't have any power outlets on your backsplash, good for you. I was freaking out about this outlet situation for a hot minute because I had no idea how to get a clean line perfectly around the plate cover, so that there wasn't a super obvious eyesore right in the center of the backsplash. Enter: outlet spacers. These things really saved my life because they push the outlet plate up just a bit meaning you can tile al the way to the actual outlet, and then just put the cover over it - so no super perfect clean lines necessary cause the cover hides it. Get these from basically anywhere tools are sold. Just always turn the power supply to the outlet OFF on your breaker (and check with a current tester that the power is actually off) before toying with these things. Then just unscrew the outlet box and wiggle it out of the wall a little bit. Then fold your spacers to an appropriate thickness and slip them between the wall and the box. Now you can tile all the way to the box without worrying about getting that clean line, because your outlet plate cover will just sit on top of it all. Like I said above, we're far from being experts on this topic. Check out these resources below to learn from the people who really showed us how!